Make sourdough starter at least 1 week before making bread. In large glass bowl, dissolve 1 1/2 teaspoons yeast in warm water. Stir in 3 cups flour and 4 teaspoons sugar. Beat with electric mixer on medium speed about 1 minute or until smooth. Cover loosely; let stand at room temperature about 1 week or until mixture is bubbly and has a sour aroma. Transfer to 2-quart or larger nonmetal bowl. Cover tightly; refrigerate until ready to use. Use sourdough starter once a week or stir in 1 teaspoon sugar. After using starter, replenish it by stirring in 3/4 cup all-purpose flour, 3/4 cup water and 1 teaspoon sugar until smooth. Cover loosely; let stand in warm place at least 1 day until bubbly. Cover tightly; refrigerate until ready to use. To use, stir cold starter; measure cold starter, and let stand until room temperature (starter will expand as it warms up). 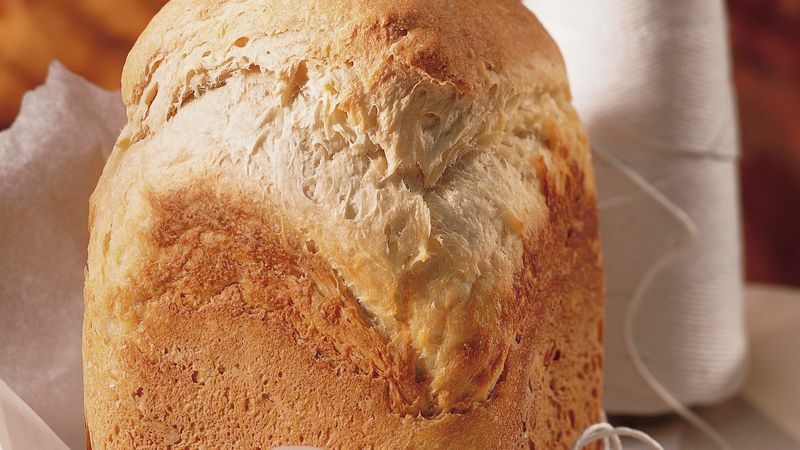 Measure 1 cup of the sourdough starter and all remaining bread ingredients carefully, placing in bread machine pan in the order recommended by the manufacturer. Select Basic/White cycle. Use Medium or Light crust color. Do not use delay cycle. (Total time will vary with appliance and setting.) Remove baked bread from pan; cool on cooling rack. Sourdough starter was the only leavening pioneers had to make breads, biscuits and pancakes. Each evening, starter was removed from the crock and set "to work" for the next day's bread. A little of the "sourdough" was returned to the crock the next day to ferment and be ready for the next time.